After doing the interview with Radio Web MACBA, I had one of those moments when you realize what you should have said. I forgot to use a favorite line of mine these days: that I don’t think of myself so much as a musicologist or a music historian anymore, but rather I think of myself as a storyteller. Writing a history of something is telling a story, and to write a good and engaging history is to come up with and deliver a good and engaging story line. To do that, you have to understand what the essence of the story is and get rid of everything that doesn’t contribute to this. When I write a note for a recording, a concert, or even something longer (like my book), this is really what I’m doing: I come up with the story line and then build everything around it. 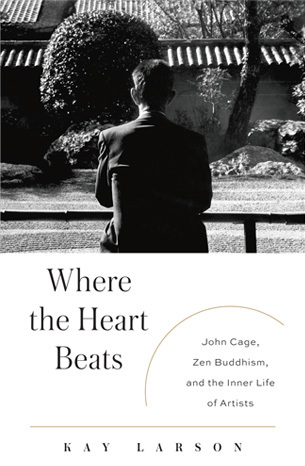 I thought of this recently as I read Kay Larson’s recent book, Where the heart beats: John Cage, Zen Buddhism, and the inner life of artists. Whenever I read a Cage book (not that often these days), I always find a bit of competitiveness arising in me. This is natural, I suppose, to compare my own work to someone else’s. As I noted this in myself, I saw that it produced a lot of quibbling and disagreement: this fact isn’t exactly right, I don’t care for this approach to that work, this interpretation is just not accurate. I was particularly prone to this since I just recently wrote my own essay about Cage’s spiritual journey in the 1940s (written, I should note, very early last year, before Larson’s book appeared). What I realized was happening was that I was comparing my story line to Larson’s and I was defending the choices I had made. I looked at these arguments more closely and realized that, in fact, Larson and I aren’t that far apart, really, at least about the critical story arc of Cage’s journey. The basic story line is so familiar as to be archetypical: man desires, man suffers, man seeks larger meaning, man discovers freedom. Cage’s desires were for fame, an center for experimental music, more performances with larger ensembles. He suffered because even the partial fulfillment of these desires left him unsatisfied. He sought larger meaning for his life and for music by immersing himself in various spiritual and religious writers, largely Asian. On these points, Larson and I are in alignment. Where we diverge is on the freedom part of the story. We both agree that Cage had a breakthrough, and that it happened in 1951 (or thereabouts), but I see the catalyst for that breakthrough as the discovery of chance operations, triggered by Feldman’s first graph piece; Larson sees it as Suzuki’s lectures on Zen Buddhism in New York City. I am a musician and my introduction to Cage was as a musician. Larson is not a musician and her affinity for Cage comes from her own Zen practice. This could be seen as accounting for our divergent views. I see the working out of Cage’s problems as taking place to a very large degree in his compositional practice, following musical lines of development. Larson sees this resolution as taking place by reading and listening to the wisdom imparted by Suzuki, following Buddhist lines of development. Because my story was a musical one, I pushed Zen to the margins (I hardly mention it at all in my essay). Larson does something a bit similar with music in her book. We are both telling our stories of Cage’s journey, just from different perspectives. Like in Rashomon, the truth is probably somewhere between, above, or below our accounts. I love the idea that Larson and I could take the same historical materials and express them through our own understanding. I also love the idea that other people can read these different versions and piece together their own truths from them. I know that, once I got over my defensiveness, Larson’s book was quite helpful in keeping me from getting too attached to my own story line, and it has inspired me to write my own version of the Cage-Zen story (current hypothesis: Zen becomes important to Cage only after the discovery of chance). I still disagree with parts of Larson’s story (her theory that the “Lecture on Nothing” comes from 1952 is just not sound, for example), but I value her motivation: to tell her story of who John Cage was.